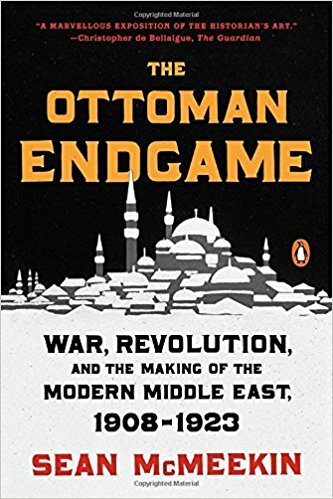 “So far from a sideshow to the First World War, the Ottoman theater was central to both the outbreak of European war in 1914 and the peace settlement that truly ended it.” (p. xviii) In The Ottoman Endgame, Sean McMeekin makes a strong argument that understanding the First World War without understanding the part of the conflict that took part in the Ottoman Empire is a fool’s errand. The tinder that was sparked by the assassination of Franz Ferdinand had been gathered into a box by the Balkan Wars and dried by conflicts between the Ottomans and other European powers, particularly with Italy over Libya and Russia over naval passage through the Bosphorous and the Dardanelles. The Ottoman Endgame draws deeply and carefully on that real historical record. McMeekin draws on primary sources in English, French, German, Russian and Turkish. One hundred years after most of the conflict has passed, something like the full archival record is now open to scholars. McMeekin deploys these sources to check accounts against each other, to see how opponents reported on the same events, to see how contemporaries on various sides interpreted events, and to show readers where accounts agree and where they diverge. One effect of this effort is to restore two states — the Russian and Ottoman Empires — as protagonists that, in my reading, had often been depicted more as objects of action in the war. McMeekin also describes in detail action on the Caucasian (and occasionally Persian) fronts, an area of conflict that was crucial to both Turkey and Russia, but which typically draws little attention in histories of the war. Russian and Turkish choices in the Caucasus affected their ability to take action elsewhere. For Russia, the Caucasus was secondary to the great struggle in Central Europe, but not by much. One of St Petersburg’s great war aims, shared even by the first government to take power after the Revolution, was to seize Constantinople, giving Russia warm-water access to the outside world. Conquering Ottoman territory along the Caucasian front offered one path to menacing the capital, an amphibious assault across the Black Sea offered another, and an attack from Thrace the third. Each approach complemented the other, forcing the Ottomans to choose where to expend their resources. For their part, the Ottomans saw conquest in the Caucasus as an opportunity to extend their empire and to either gain a buffer or reach a defensible border against the perpetual enemy to the north. The Ottoman Endgame is a military and political history. The questions that McMeekin explores are those of territory, rulership, and war. Concentrating on these areas allows him to go into considerable depth on the topics he has chosen, while keeping the book to a very readable 500 pages. Modern imaging and printing technology also come to his aid, enabling him to offer more maps than chapters, illustrating both fine points (the rings of naval defenses at the Dardanelles) and the wider sweep (the proximity of Ottoman-Russian conflict in Persia to the British thrust in Mesopotamia). McMeekin has also chosen his chapters and divisions carefully to depict key issues. He spends considerable time on the efforts the two sides made in 1914 to draw Turkey into the war, or to keep it on the sidelines. He shows both the contingency of the eventual choice to join the Central Powers and how well deserved the Ottoman reputation for duplicitous diplomacy was. Of course, less-than-total commitment is a running theme in the book. The Russians never showed up in time to take pressure off the British forces at Gallipoli; the British declined to invade at Alexandretta, where a successful attack might have split the Ottaman Empire into north and south; Russia and Greece eyed one another suspiciously, each coveting Constantinople. The story in eastern Anatolia, the Caucasus and Persian Azerbaijan is one of successive waves of victory, overextension and retreat by both Turks and Russians from 1915 all the way through 1920. When the Turkish Grand National Assembly signed an agreement with Soviet Russia, there were Turkish troops in contemporary Dagestan. The fighting had outlasted both empires. McMeekin details Ottoman efforts to seize the Suez Canal, breaking Britain’s lifeline to India. Likewise, he covers Cairo’s efforts to stir Arab rebellion, arguing that the caliph in Constantinople was a poor example of Islamic rule, one that pious Muslims could and should overthrow. Meanwhile, troops of the British Empire, including numerous Muslim soldiers, were making their way up the Tigris and Euphrates to conquer the Ottoman territories in Mesopotamia. He argues for the importance of the Balkan front for the end of the Great War in the West, too. After the collapse of tsarist Russia (to which McMeekin gives sufficient detail), the Central Powers fell out over the division of the spoils presented by the Treaty of Brest-Litovsk. The Bulgarians, reluctant allies at best, received little of former Russian territory or of the grain being shipped out of Ukraine. (Grain that was difficult enough for the German occupiers to extract from a recalcitrant peasantry.) The Bulgarians were holding the Macedonian front nearly alone against growing numbers of Greeks, French and British. They cracked. A French-led offensive in September 1918 had by the end of the month created a breakthrough 50km wide and just as deep. At the same time, American troops were arriving in strength on the Western front. McMeekin writes, “what remained of Germany’s first-line troops could make a final stand at the Siegfried line in the west, or redeploy east to defend the vast, totally unmanned expanses of Central Europe against Franchet d’Esperey’s army. They could not do both.” (p. 397). And thus the Central Powers rapidly crumbled, leading to an armistice in the West in November 1918. No such end came to the war in the Ottoman lands. The Entente intended to carve Turkey up completely, imposing peace by assigning various territories to external oversight. Some of that plan was enacted, such as the British mandate in Palestine and the French presence in Syria. Other parts led to catastrophe, particularly support for expansionist Greek aims first along the Aegean coast and later in large swathes of Anatolia and up to the Pontic coast. McMeekin continues his careful military history into the battles that led to the founding of the Turkish Republic under the leadership of Mustafa Kemal. McMeekin also gives careful attention to the question of Armenian genocide during the war. He looks at orders, population figures, accounts of Russian forces fighting with Armenian irregulars at their side, reports from survivors, and more. He considers the latest scholarship about what can and cannot be inferred from available evidence. It’s a thoughtful chapter, weighed with care and placed in context.